Before the season, I wanted to write a look-ahead article to next year; sort of a quick preview of the long view, but I couldn't get to it before the season started. However, I'd still like to look ahead to next year anyway, and see what the future could bring for the Yankees as they head into the new stadium. 2009 is a correction year in a lot of ways for the Yankees, as a lot of mistakes will be deleted this off-season. Three names on the top of the list: Kyle Farnsworth-less, Carl Pavano, and Jason Zombie are all due to come off the payroll as thank god, their contracts are up. That alone will be 45 million dollars freed up—or more than the entire Tampa Bay Ray team. Add on Bobby Abreu (16 million), Andy Petitte (16 million), Latroy Hawkins ($3.750 million), Morgan Ensburg (1.75 million) and Mike Mussina (11 million) and that adds up to roughly 93 million dollars off the Yankees drowned hippo-bloated payroll. Or a few dollars short of the entire Toronto Blue Jays roster. Now, I feel the last Yankee dynasty died the second Jason Zombie put pen to Yankee paper and the Bombers gave better glove-man and professional batsman, Nick Johnson the heave-ho. That was when the Yanks decided to abandon the build from within credo that supplied Bernie, Derek, Jorge, Mariano, Andy and co. 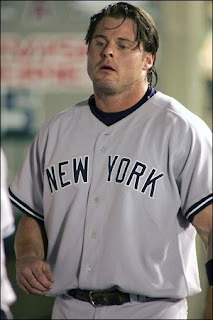 Since then, the Yanks have relied on the Randy Johnsons, Jared Wrights, Kevin Browns and the Robbie Venturas. In short, that was when the Yankees tried to sign their way to more championships and completely abandoned the method that actually got them the championships: namely, create a core of players from your farm, and sign free agents strategically, to modest contracts (Paul O'Neill, Scott Brosius, David Wells, Graeme Lloyd). Going forward, this is a pivotal year for the Yankees, as a large portion of what they decide to do in the future could hang on how they perform on the field. If the Yankees crash and burn this year, the youngsters in the rotation suffer a lot of growing pains, and they are in no real contention for the playoffs, you can expect the Yankees to drop a cash bomb in free agency and take no prisoners—C.C. Sabathia, Mark Teixeira and so forth. If the Yanks keep it close, get into the playoffs, and at least keep it respectable and the youngsters perform fairly well, look for the Yankees to go into free agency with more modest goals. Probably still Sabathia or maybe Ben Sheets, but maybe just replace Hawkins and Farnsworth. But maybe they let Teixeira go. Also, a lot of what the Yankees may do depends on what goes on down on the farm. If Austin Jackson and/or Jose Tabata have years where perform well, and get called up around September, then the Yankees will feel comfortable letting Abreu go and reaping the draft pick. But if Jackson and Tabata regress and Brett Gardner is nothing but a pinch runner/fifth outfielder type, than the Yanks may have to resign Bobby or maybe go after Pat Burrell or Jay Payton. And the outfield, outside of Melky, stays old. Same thing with first base. Do we trust Shelly Duncan enough to at least platoon? Eric Duncan? Juan Miranda? A lot depends on how they perform and if it's enough to trust them. Another problem, and one that we as Yankee fans, have wanted to avoid, is Jeter. He's 34, Yankee fans. And let's face it, he's not going to be getting any better—yoga and stretching exercises or not—his range is not going to get better, only worse, from here on. And unlike Cal Ripken and a lot of other shortstops who get older and who's range decreases, Jeter can't move to third base—as A-Rod is there for the next 7 to 10 years. So, while this is not a problem for 2009 necessarily, what is the long-range plan for Jeter? Again, he's 34. What if he starts to get injured a lot more and his play at shortstop decreases precipiticily? Do we try to move him to first? Do we make him a platoon SS/DH type? Just a question going forward. Of course, there's still the Jorge question, but the Yankees seem comfortable right now with the Posada/Molina combo until some of the youngsters, like Jesus Montero or Francisco Cervelli, develop. Same thing with the pen. Who knows how much Mariano has left, but the Yankees seem, for now, to be content until some of the youngsters develop, and seem willing to let Joba move to the rotation. I just can't see Igawa making the jump...consider him a bust and anything he gives to be gravy. Maybe we sign a Randy Wolf or an Aaron Fultz or some other lefty out there. Also, I'd love to give Edwar Ramirez a shot here, but I have to ask...is he a AAAA pitcher? If he can develop a nice fastball that sets up his awesome change, maybe he can contribute. Humberto Sanchez is also a possibility depending on how he recovers from his injury and how he performs starting June. As much as I would like the Yankees to give the youngsters a chance and let Shelley, Juan Miranda or Eric Duncan fight for the spot, my guess is the Yankees sign Mark Teixeira. Robby Cano has this locked up for the next decade. For the next couple of years, barring injuries or rapid decline, this stays with the captain, Derek Jeter. Like I said, a lot depends on how Tabata, Jackson and Gardner play. Jackson and Tabata are on everyone's superstar-in-the-making- listing, but the wild card is Gardner. Only 5'10" and damned with the "consistently overlooked" mark, Gardner is a God-made leadoff hitter. Baseball America says he has the best strike-zone discipline in the Yankee farm system. GM Brian Cashman called him "Juan Pierre...who can take a walk." Which sounds exactly what the Yankees need. Let's face it, Damon, who I never wanted, has been a disappointment. He hasn't been setting the tables, distracting pitchers or doing anything to spark the team. And his arm was even worse than advertised, worse than Bernie's. That said, it's hard to imagine not having a Damon/Hideki LF/DH platoon at least through 2009 (when both their contracts end), unless the Yanks manage to pull some sort of salary dump trade for either of them. Melky Cabrera is firmly in center for now and the foreseeable future (unless Austin Jackson, who's all of 21, proceeds quicker than thought and is ready to assume superstar status in CF). And the Yanks would love if Jose Tabata is ready to take over in right field. 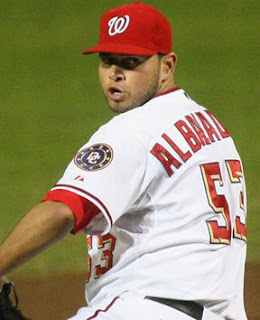 However, my guess is, the Yanks sign a vet to ease Tabata (who won't turn 20 until august) into right field. Like I said, maybe they sign Pat Burrell, though maybe an older vet, like a Cliff Floyd or Jay Payton might be better, if Jackson or Tabata is ready to be weaned into a semi-permanent rotation. Resigning Abreu also might be an option, which ultimately, is what I think the Yankees do...until the kids are ready. To sum up, let me just say, this is not what I want the Yankees to do, rather what I think they will do. Like I said, I'm more willing to give Shelley, Gardner and some other kids a shot. The Yankees, however, trying to justify filling expensive seats in a brand new stadium have more on the line. Which is why I think they do what I said above. Man, the Yankees look OLD. It will be good to see some of the fat trimmed and some new faces brought in. Teixeira would look really good hitting ding dongs in the new ballpark (btw, I just passed by there on the 4 train headed north and I got goosebumps).